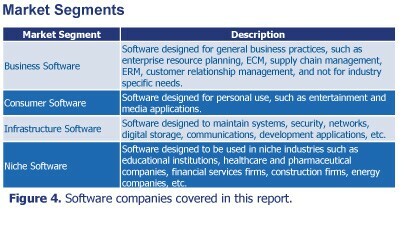 Q1 2011 Software Industry Trends - Berkery, Noyes & Co., LLC. Software transaction volume has remained consistent in Q1 2011 from Q4 2010, while value dropped 30%, a decline which can be attributed to the lack of multiple billion dollar transactions during the quarter, which have historically bolstered the industry’s aggregate transaction value. 2010 saw over 10 transactions valued at more than $1 billion, while Q1 2011 had only eBay, Inc.’s purchase of GSI Commerce, for $2.14 billion,the largest transaction of the quarter. While last year’s Top 10 Notable Transactions contained seven Infrastructure Software transactions, this quarter’s list reflected just one, the acquisition of Aster Data Systems, a provider of databasesystems for data warehousing and analytics, by Teradata Corporation for $263 million. The Business Software segment was well represented this quarter by Salesforce.com Inc.’s $308 million acquisition of Radian6, a solution to monitor social networks. Of Q1 2011’s Top 10 Notable Transactions, seven fell into our Niche Software segment, with software companies servicing the healthcare industry emerging as the most active in Q1 2011. The largest acquisition among these healthcare software transactions, and one of the largest dentistry software transactions ever tracked by Berkery Noyes, was Align Technology, Inc.’s acquisition of Cadent Inc. for$190 million. Two other notable healthcare industry transactions just missed inclusion in the top ten: Harris Corporation’s acquisitionof Carefx Corporation for $155 million and McKesson Corporation’sacquisition of System C Healthcare plc for $140 million.